On Tuesday, I wrote about a new dealership in Sarasota, Fla. — the Viage Group — that’s using its success at the St. Petersburg Power & Sailboat Show to catapult the business forward. Today I am going back in time to explain the success of a Markdale, Ontario, boatbuilder that displayed its product at the St. Pete show — Rossiter Boats and its Florida dealer Big Toy Storage and Sales of Venice. Scott Hanson took over this boatbuilding company of small powerboats and rowing craft from the founder George Rossiter in 2007. Hanson’s relationship with the business started on the ski slopes. Who would’ve thought, right? Hanson met Rossiter while snow-skiing and later bumped into him again at a cocktail party. And he has taken advantage of that opportunity. In the last year, Rossiter has built 100 units and next year Hanson believes that number will increase to 150. Rossiter’s 15 employees work out of a 92,000-square-foot building. Rossiter builds semicustom rowboats and powerboats, including seven models of rowing boats, which include yacht tenders, skiffs, recreational sport shells and its most popular model, the 17-foot Loudon. George Rossiter about 20 years ago added a 14-foot deep-vee powerboat to his fleet. “He wanted a boat that was surefooted and soft and dry,” Hanson said. “And he said a deep-vee is where we’re going to start.” Rossiter added a flat lifting pad on centerline for easy planing. 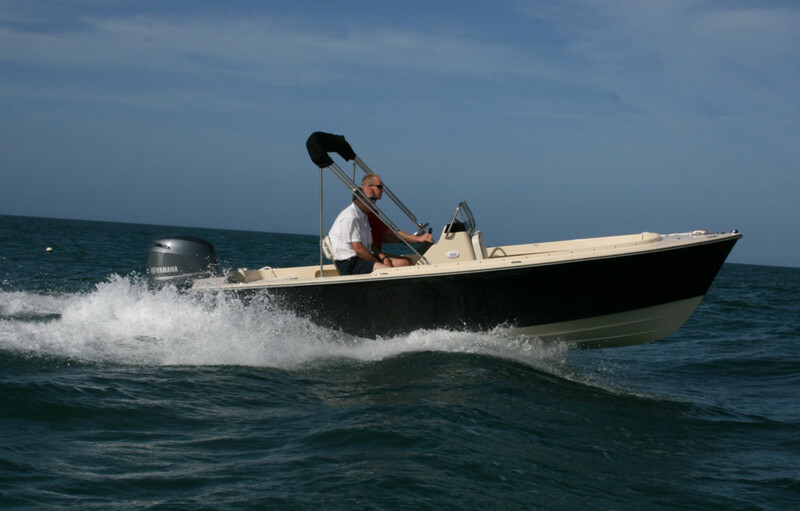 Hanson used the 14’s design to create a 17-footer in center console and runabout models. The company is working on a 23-foot runabout that it expects to debut at the Palm Beach International Boat Show. Hanson has seen high interest for his boats in Florida. I had the opportunity after the boat show’s conclusion to demo the 17-foot center console with a Yamaha F115 and a 14-footer with a Yamaha F40. And those lifting pads do indeed work. These boats are quick to plane and can stay on plane at low speeds. I had the 17-footer cutting through 2- to 3-foot seas at a 12-mph clip in the Gulf of Mexico. “The simplicity of our boats is their beauty and the ride is the surprise,” Hanson said. Simple, but high-end: The 14 with a 40-hp engine ranges from $18,000 to $20,000 and the 17 with an F90 comes in at roughly $35,000.